Gone are the days when Bugatti used to sell just a single model. Right now, the automaker sells the Chiron, Chiron Sport, and the Divo. Earlier this month, Bugatti also unveiled a new special edition version of the Chiron Sport celebrating the company’s 110th anniversary and French heritage. Rumors also suggest Bugatti is planning to unveil yet another one-off Chiron at the Geneva Motor Show next March – and it’s going to be something very special. Sources claim the one-off hypercar car was built for Dr. Ferdinand Piëch, the 81-year-old former chairman of the Volkswagen Group supervisory, and is worth a whopping $18 million. Details remain under wraps for now, so it remains to be seen how the one-off model will be distinguished from the standard Chiron. Inevitably, it hasn’t taken long for render artists to try and predict what the mystery $18-million hypercar will look like. Artist Rain Prisk has envisioned Bugatti’s new one-off hypercar as a Speedster version of the Divo, and the result is simply stunning. The artist has given the Divo a dramatic makeover, with an aggressive aerodynamic body kit and a traditional speedster engine lid. Elsewhere, the shape of the headlights has been redesigned for the hypothetical Divo Speedster, as have the side skirts, side intakes, and wheels. We would love to see Bugatti make a one-off Divo Speedster, but we’ll have to wait until the 2019 Geneva Motor Show kicks off on March 5 to see what the automaker has been cooking up. 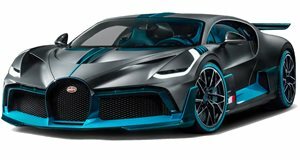 Bugatti’s new one-off hypercar will almost certainly be powered by the same 8.0-liter quad-turbocharged W16 engine found in the Chiron. Unlike the Chiron Sport and Divo, it could pack even more power than the 1,479-hp Chiron.